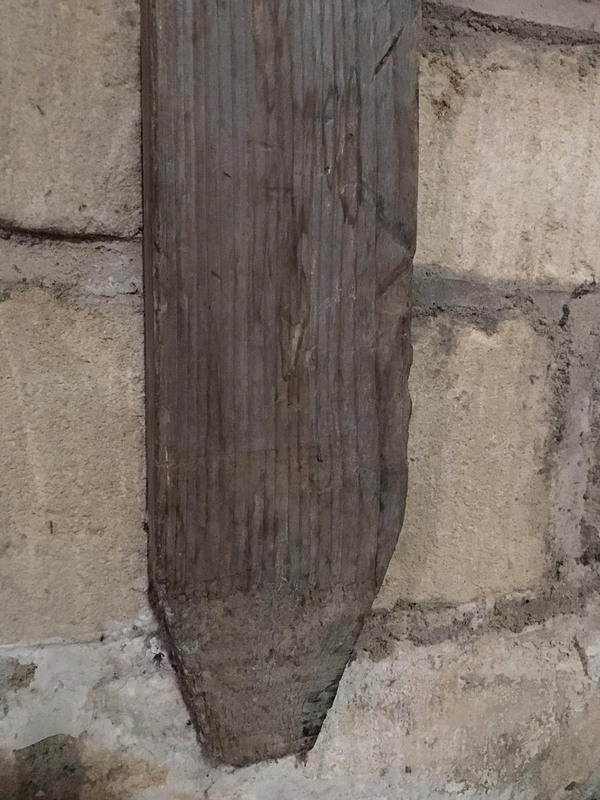 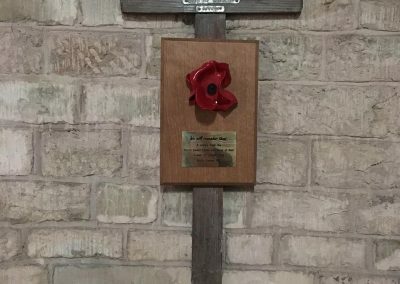 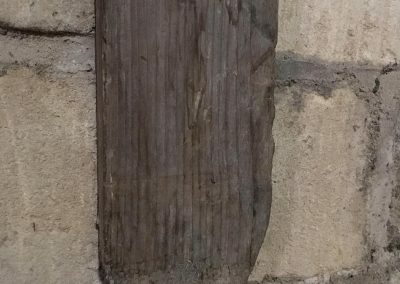 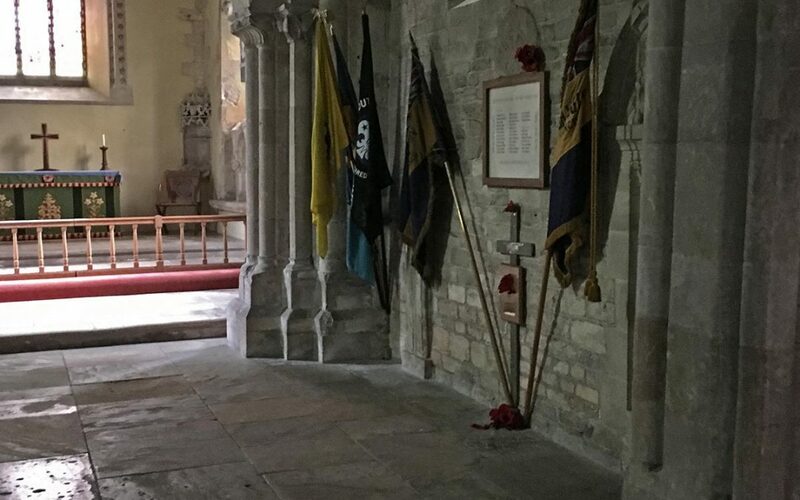 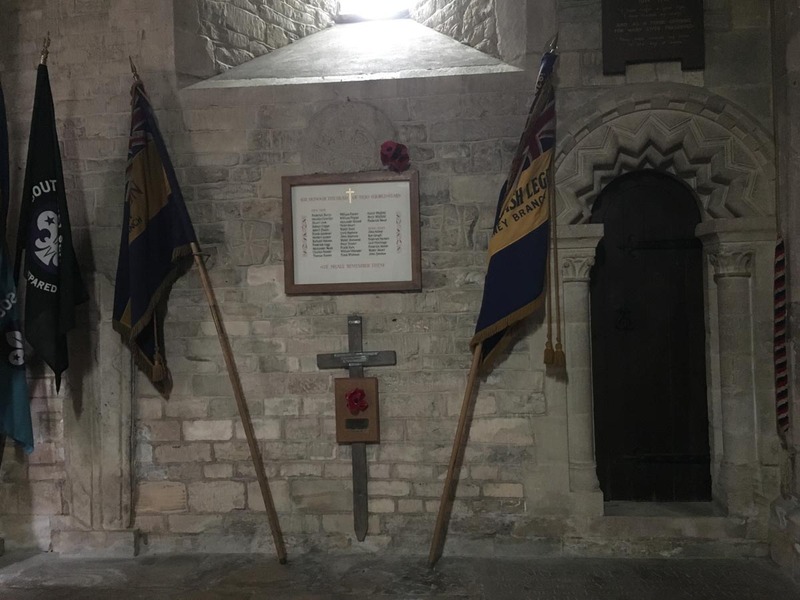 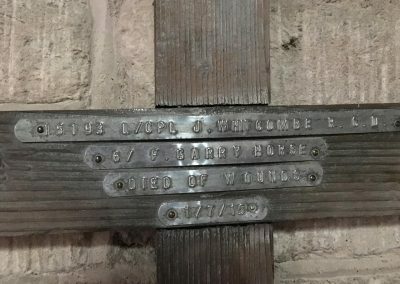 A plaque has been fixed to the vertical shaft of the cross by unseen means – either screw or adhesive – in 2014, containing a ceramic poppy from an artistic display at the Tower of London commemorating the fallen in the Great War. 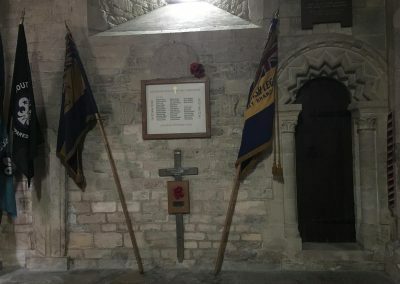 The plaque is only a few inches off the floor and is situated below a framed roll of honour of South Cerney residents. 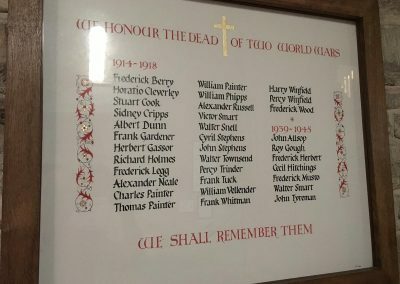 John is not included in this list. 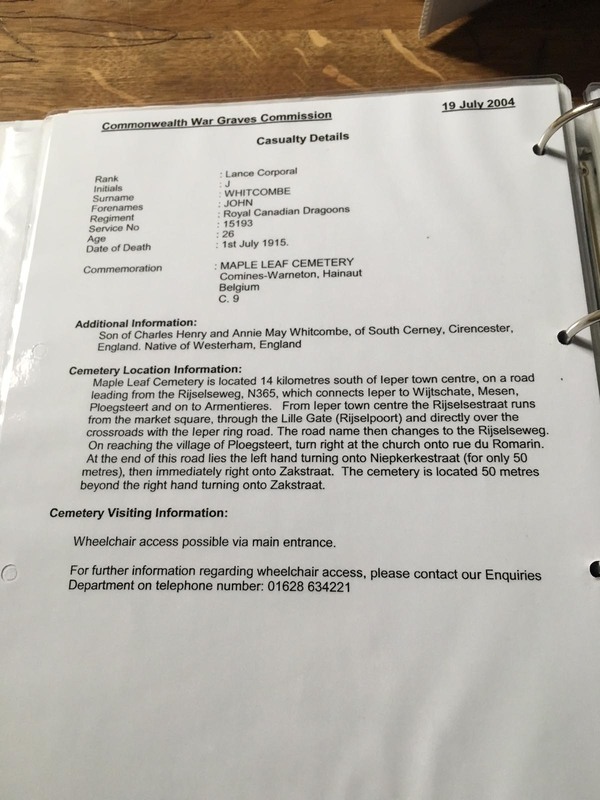 Biographical information: On the 1911 census, John’s parents were still living in Kent, but research has shown his parents were later living in South Cerney in 1925 when his father died. 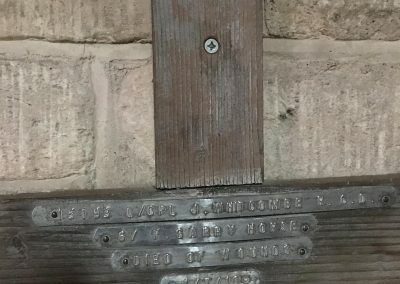 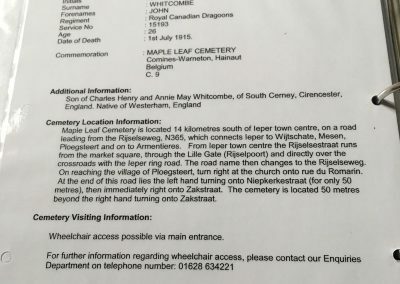 This may explain why this particular marker ended up in South Cerney, and not Westerham or Canada. 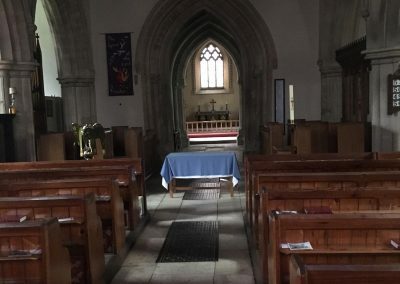 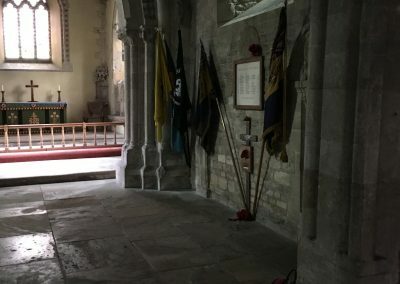 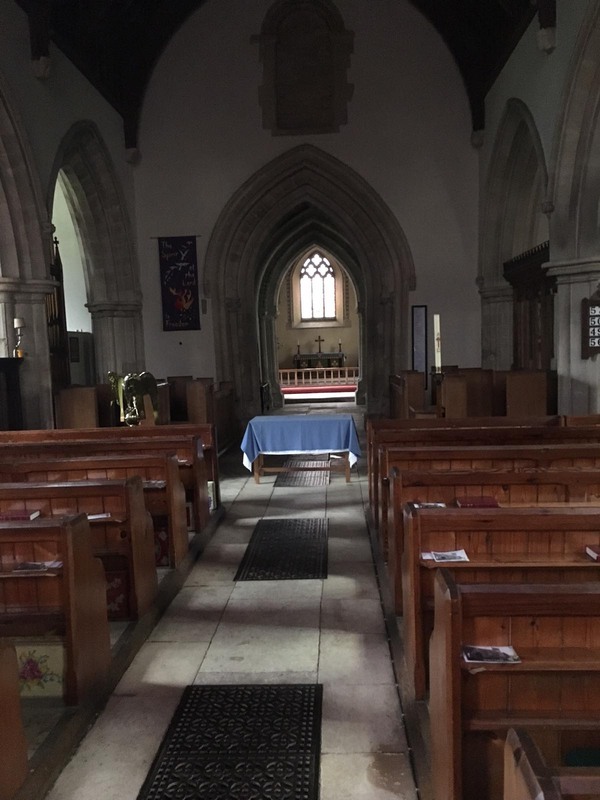 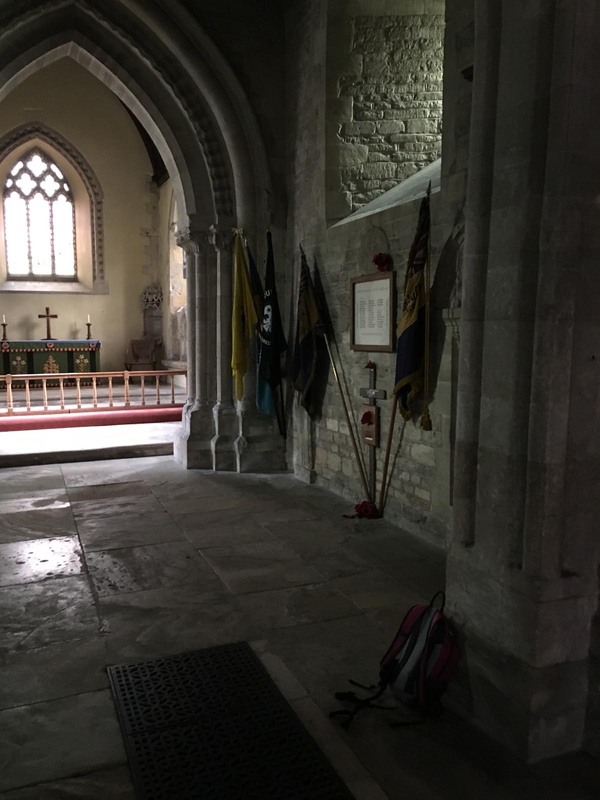 The church has a number of useful folders containing copies of the register of baptisms, marriages and military deaths/burials in All Hallows’ Church. 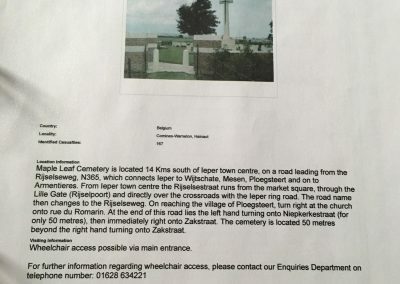 I photographed the pages relating to LCpl WHITCOMBE and Maple Leaf Cemetery for additional information. 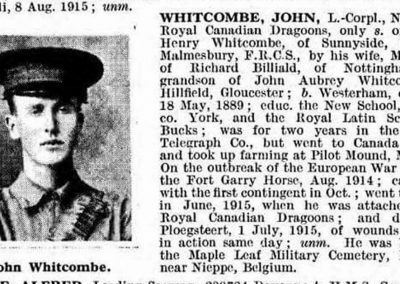 15193 LCpl John WHITCOMBE was born 18 May 1889 in Westerham, Kent; the only son of Charles Henry WHITCOMBE FRCS, of Sunnyside, Crudwell near Malmesbury, Wilts by his wife May, daughter of Richard BILLIAD of Nottingham. Grandson of John Aubrey WHITCOMBE of Hillfield, Gloucester. 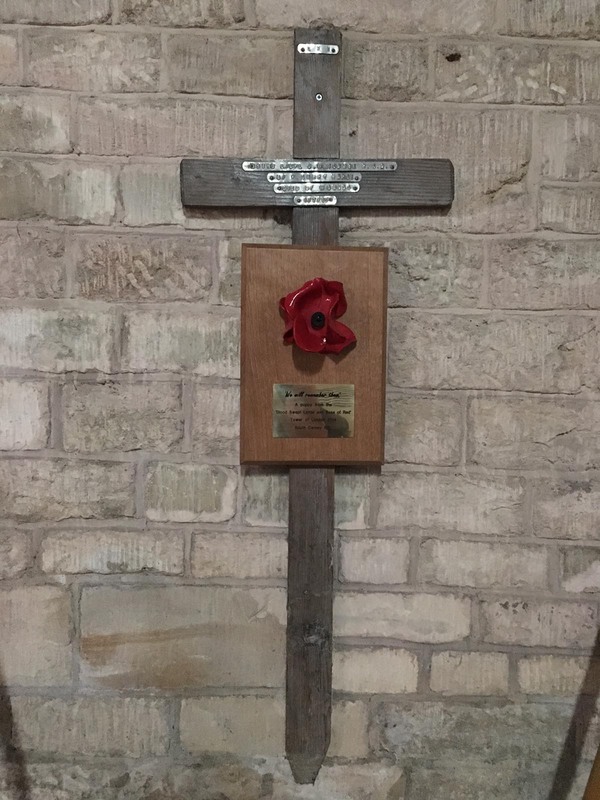 Education: The New School, Halifax, Yorkshire. 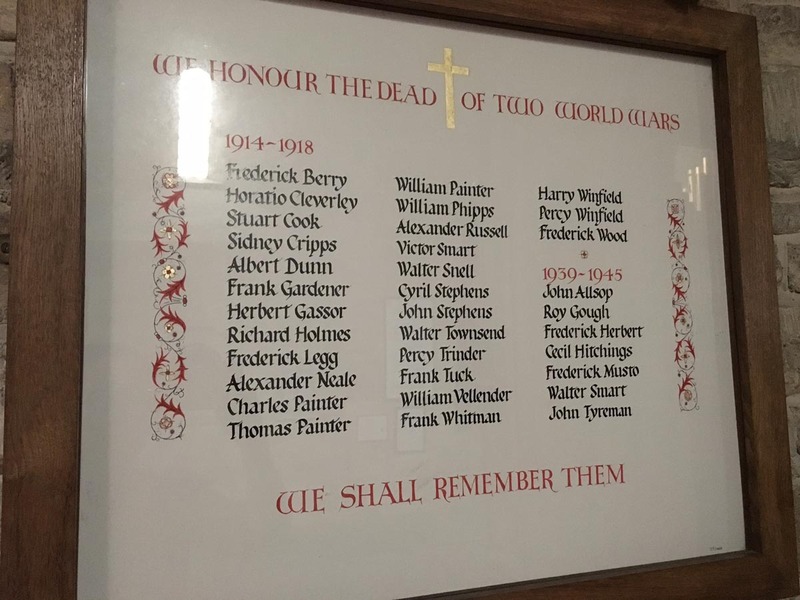 The Royal Latin School, Buckinghamshire. 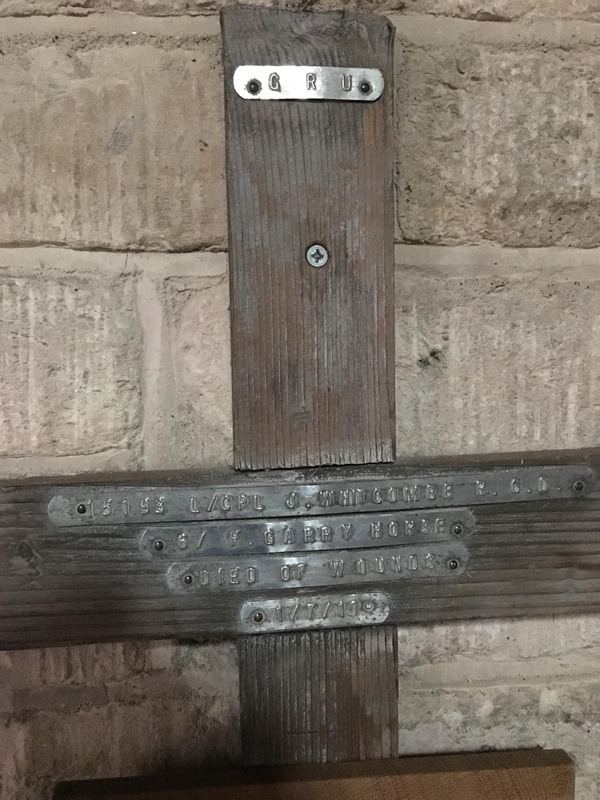 John worked for 2 years at the Eastern Telegraph Company before emigrating to Canada in 1907 to take up farming at Pilot Mound, Manitoba. 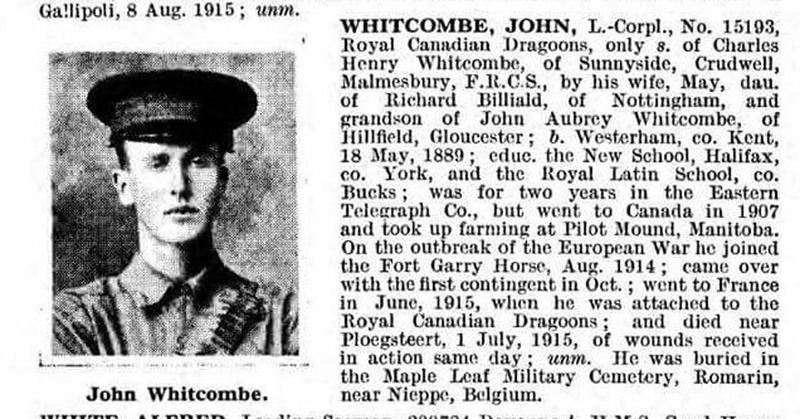 On the outbreak of the European War, John joined the Fort Garry Horse in August 1914, came over with the first contingent to England in October 1914; went to France in June 1915 when he was attached to the Royal Canadian Dragoons and died near Ploegsteert on 1 July 1915 of wounds received in action the same day. 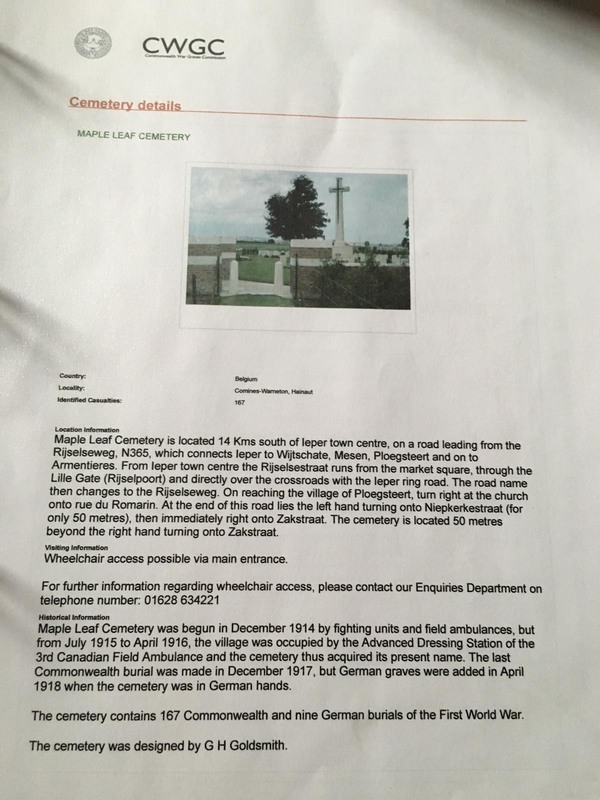 He was buried in the Maple Leaf Cemetery, Romarin near Nieppe, Belgium.